It was another very well attended meeting. Don't forget Trophy Presentation Night on Saturday 25th January 2014. Russ - SFCC Publicity / Website Coordinator. The weather for our final competition was as good as it could be for October, with light winds and a flat sea, so conditions were perfect. An excellent turnout of club members all began trying to hunt down the elusive Whiting. Some covered many miles while others settled for their favourite inshore marks. There were quite a few Whiting caught but they were mostly just very, very small. Yours truly and Tommy Dell, fishing aboard J's Pleasure, fished some old Whiting marks, and within a very short time caught lots of fish, with two big enough to weigh in. Even though the fishing was not great everyone agreed it was a cracking day. Don't forget our Fishing Group Meeting is on Friday 15th November, 8:00pm start. Please come along to voice and/or discuss any opinions you may have regarding the SFCC fishing section. John - SFCC Fishing Secretary. The Whiting Competition will go ahead on Sunday 6th October, weather permitting. The Whiting Competition has been rescheduled to Saturday 5th October, or Sunday 6th October, weather permitting. The first day of the Ladies and Men’s Bass & Wrasse Comp was on Sunday 25th August. The weather was not ideal, but it was not bad enough to cancel. It was well attended, with 19 members fishing aboard 9 boats. Unfortunately Bass have been very difficult to find this year and proved so on this day too. Most boats fished local wrecks, with some going further afield in the hope of finding the big one, but it was not to be. John Hall’s Bass of 3lb 6.6oz, fishing aboard his boat 'Blue Mist' was the biggest Men’s Bass on the day, but out-fishing us all, and going a fraction of the distance, was Carolyn Whiting’s Bass of 4lb 3.8oz, fishing along Ladram Bay aboard her own boat 'Our Molly'. Day 2 Bass and Wrasse Comp eventually took place on Sunday 22nd September. This time the weather behaved itself, with over 20 members fishing, but like the first day there were very few Bass caught. Bass catches generally, have been down by about 25% this year. Two members improved their catch from the first day, Bob Willis with a Bass of 2lb 2.4oz aboard 'Blue Mist', and Kevin Rouse with a Bass of 4lb 6.6oz caught aboard his new rib 'X Pro'. This Bass was the biggest caught over the two days, and like Carolyn, Kevin caught his fish inshore rather than from on a wreck. The Men’s and Ladies part of the Wrasse Competition seems to have taken a back seat with everyone concentrating on the Bass, but well done Carolyn for winning the Wrasse Comp with a Wrasse of 2lb 8oz caught aboard 'Our Molly'. The Whiting Comp, weather permitting, will be Saturday 28th September, or Sunday September 29th. 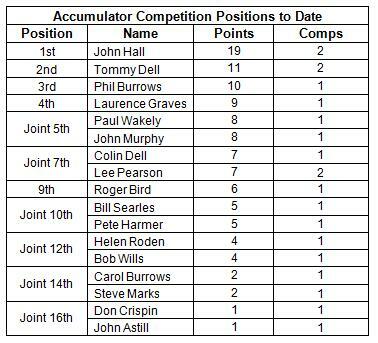 As you can see by the Accumulator table below, and except for John Hall who is untouchable, it is still wide open for the top three and also wide open for the top six places. Everything hangs on the Whiting Competition. New date is Sunday 22nd September. New date is to be advised. Even though the weather was different to the forecast the competition went ahead. With winds stronger than predicted, it took most of us more than one attempt to fix the anchor. But once the competition was underway the lead changed hands several times. Small conger were coming over the side from Blue Mist and J’s Pleasure, but eventually the first decent Conger of 27lbs was pulled aboard J’s Pleasure. Then John Hall called up that they had one on board of 37lbs. As the day went on J’s Pleasure pulled aboard one of 47lbs. At this late stage J’s Pleasure thought they had it in the bag, only for Blue Mist to call up to say that they had one of 55lbs, which eventually won this day. It was also a good productive day for Mark Fox aboard his boat "Lighting", with a Bull Husk of 10lb 8oz. He was led to believe that it was a Lesser Spotted Bull Husk, and a very rare new club record, which he was duly proud of. But we had to tell him in the end that there was no such species. This will run on Sunday 1st September, weather permitting. Day 1 is to be fished on Sunday 25th August, weather permitting. A debrief in the club on Sunday evening, with a Chinese order, is also part of the plan. The weather was kind, the light winds and sunshine were appreciated. It was another good turnout with 12 boats, eight of them fishing on the Tardice, and seven of these within 200 metres of each other. The prospect of catching Bream should have been brilliant, with all the rubby-dubby in the water. But unfortunately this was not to be, and only two members caught a Bream. Phil Burrows had a Black Bream of 1lb 10.2oz, fishing abord his own boat 'Catch 22', which gave him 9 points on the day. He also caught a nice Smoothhound. 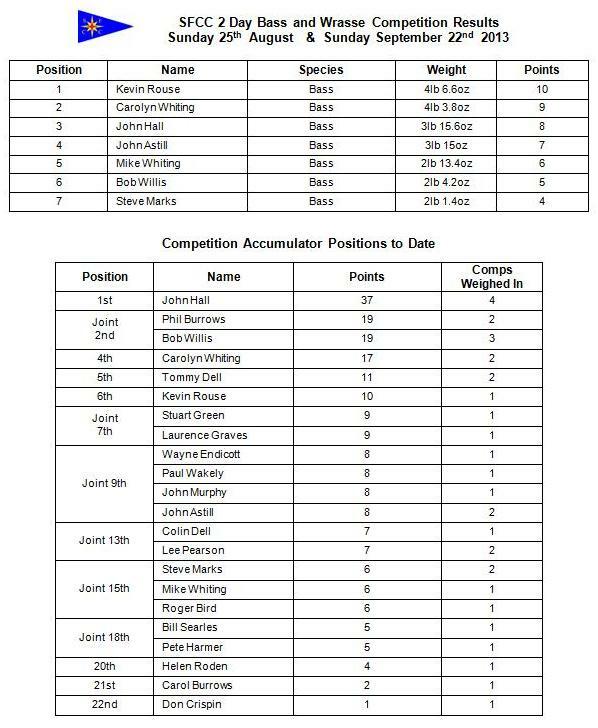 However, it was Bob Willis in first place, with a Black Bream of 2lb 2.2oz, giving him 10 accumulator points. Bob was fishing aboard Mark Fox's boat 'Lighting'. For those who don't know, Bob is one of our newer members, who is making a habit of rubbing the noses of some of the more establised fishermen in the club, especially with his green flourescent line. And long may it continue. One note of interest, there was a wrestling match aboard 'J's Pleasure' between Tommy Dell and Steve Marks who took on a 47lb Conger. Our two intrepid fishermen were jumping around like fire-crackers trying to get hold of the fish for a photo shoot, but fortunately the Conger got the better of both of them, and it swam off to fight another day! 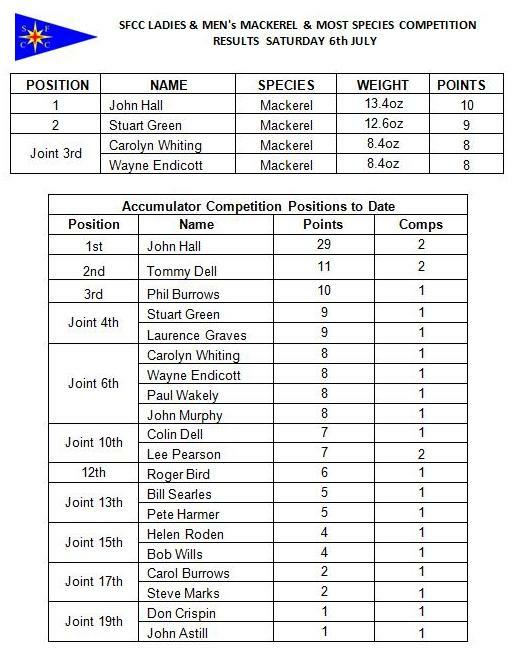 The Next Competition is the 1st day of the Ladies and Men's Bass & Wrasse Competition on Saturday 24th, or Sunday 25th August, if it's the better day. Interclub Specimen Competition on Saturday 29th July has been curtailed due to an unfavourable wind forecast. However, the evening social event at SFCC is still good to go. Food, served about 7:30pm, and a live disco too. 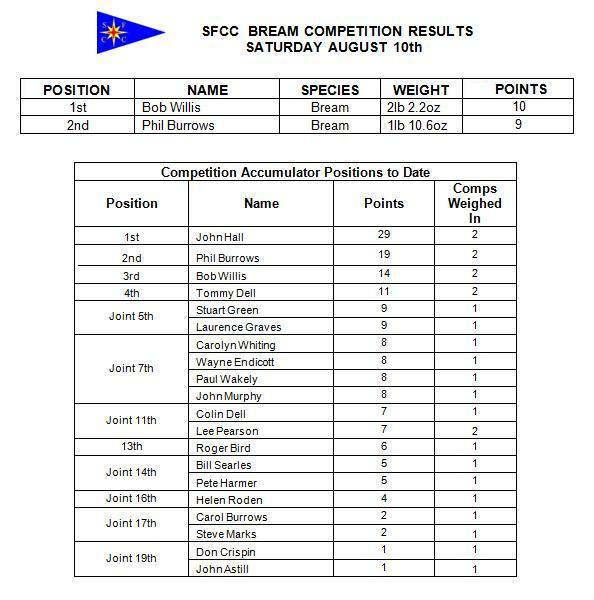 Next Competition is Bream, on Saturday 11th August, or Sunday 12th if the better day. What a brilliant day we had for the Mackerel and Most Species competition. It certainly encouraged the fishing members to take to the water in their boats, but due to the algae bloom catches were a little down. This did not stop John Hall and Stuart Green from getting two nice Mackerel specimens. John's Mackerel weighed 13.4oz and Stuart's weighed 12.6oz, both fishing aboard "Blue Mist". Carolyn Whiting won both the Ladies Mackerel, and Most Species, aboard her boat "Our Molly". There were three joint winners of the Men's Most Species, Tommy Dell, Roger Bird, and Colin Dell, all catching 5 species each, fishing aboard "Dream Catcher". Next Competition is the Interclub SFCC vs EDSFC, on Saturday 20th July, followed by a social evening at SFCC. As we are hosting the competition this year we will also be providing a meal, with entertainment, in the club on Saturday evening 7.30 for 8pm. All funded by SFCC. It would be nice to see a good turnout for the competition, as well as the evening do. All those I have not spoken to, especially new members, who will be coming to the evening do, can you please let me know as soon as possible, as we need to know the numbers for the catering. Thank you. Conger Competition on Sunday 30th June was postponed until further noitice. Next Competition is Mackerel and Most Species (Ladies and Gents awards), on Saturday 6th July, or Sunday 7th if the better day. Conger Competition will now be fished on Sunday 30th June. Bob Wills and Helen Roden are now joint 12th. This comp was really hard to judge weather wise. First it was on, then it was off, but eventually I made the call. And 18 members decided they would brave the weather and fish. We had 12 members weighing fish in, and with everyone catching something. So it turned out to be a good days fishing. 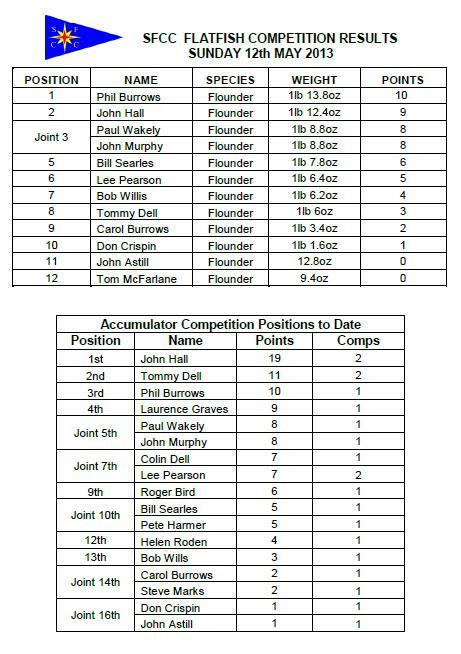 Well done to two new members, firstly Bob Willis, who entered his first competition and caught a Flounder of 1lb 6.2oz, taking 7th place. And also to John Murphy, who caught a Flounder of 1lb 8.8oz, which took joint 3rd place. Hopefully we will see alot more of these fishermen in future comps. But not forgetting our winner of this competition, Phil Burrows, with a fine specimen Flounder of 1lb 13.8oz, and caught aboard his own boat "Catch 22". It is good to see ladies holding their own in our competitions. 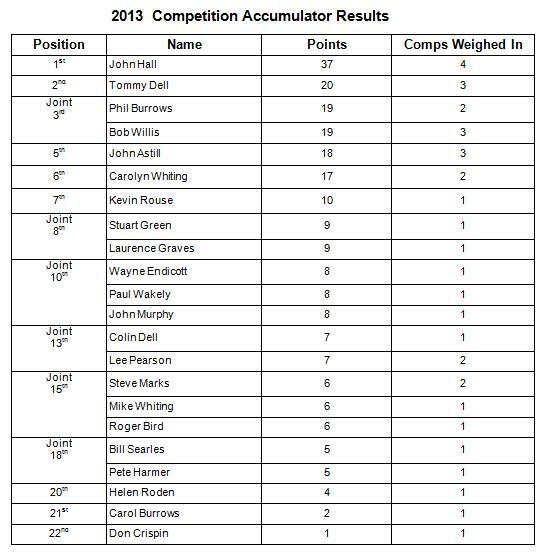 As you can see, points wise, the Competition Accumulator is already looking interesting. Hope to see you all at the next competition, which is the Conger Comp on Saturday 15th, or Sunday 16th June, weather permitting. Flatfish Competition will be fished on Sunday 12th May. Flatfish Competition will be fished, (weather permitting), on Saturday 11th May, or on Sunday 12th if it is the better day. It was good to get our first Comp off on the weekend it was supposed to be held on. Most of our members got an early start, as the winds were forecast to increase in the afternoon. We had up to 20 people fishing on various boats within the bay, and at the end of the day it was nice to see so many of our members weighing in their heaviest Pollack. Unfortunately only the first 10 qualified for points towards the 2013 Competition Accumulator. 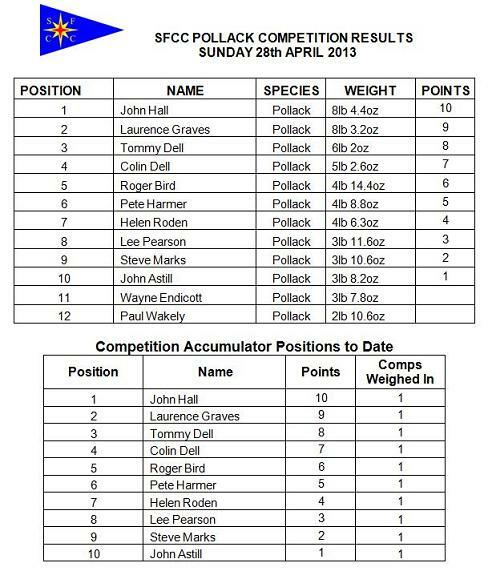 John Hall's early start certainly paid dividends, with the top three fish caught aboard his boat 'Blue Mist'. Let’s hope the rest of our season goes as well. SFCC's next competition is the Flatfish on Saturday 18th May, or Sunday 19th May, weather permitting. A proposed schedule is now available online. Bouyage between Turf Lock and Topsham. With the new season approaching, Fishing Latest webpage has been stripped back, and is now awaiting something to say.